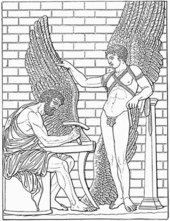 Daedalus constructs weengs for his son, Icarus, efter a Roman relief in the Villa Albani, Roum (Meyers Konversationslexikon, 1888). In Greek meethology, Daedalus (Auncient Greek: Δαίδαλος Daidalos, perhaps relatit tae δαιδάλλω "tae wirk airtfully"; Laitin: Daedalus; Etruscan: Taitale) wis a skillful craftsman an airtist. He is the faither o Icarus, the uncle o Perdix an possibly an aa the faither o Iapyx, awtho this is unclear. ↑ R. S. P. Beekes, Etymological Dictionary of Greek, Brill, 2009, p. 296. ↑ "This is the workshop of Daedalus," wrote Philostratus o Lemnos in Immagines (1.16), "and about it are statues, some with forms blocked out, others in a quite complete state in that they are already stepping forward and give promise of walking about. Before the time of Daedalus, you know, the art of making statues had not yet conceived such a thing." This page wis last eeditit on 13 Januar 2017, at 12:03.